Left to right: (a) No. 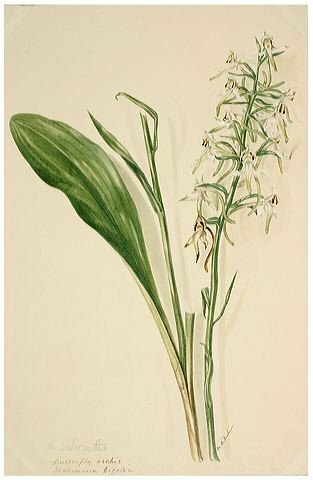 83, the Lesser Butterfly-Orchid, one of the rare specimens collected from the Cirencester area in Kent in 1848. (b) No. 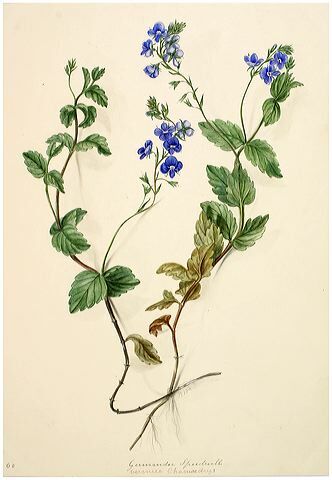 21, Germander Speedwell, collected from near Ponteland, Northumbria, in 1846 — the species of wild flower featured in Millais's Little Speedwell's Darling Blue. (c) No. 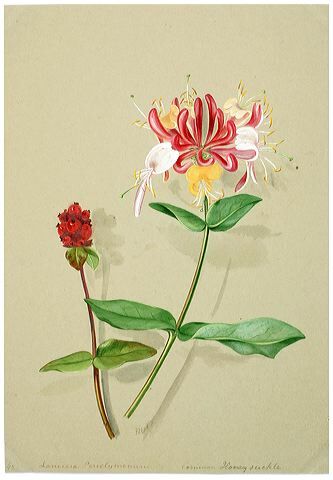 206, Honeysuckle or Woodbine, collected from Wetheral, near Carlisle, Cumbria, in 1855. Honeysuckle was the inspiration for one of William Morris's best-loved designs. 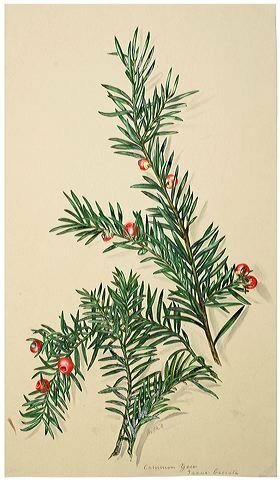 Margaret Rebecca Dickinson was a talented botanist who collected plant specimens from all over Britain and illustrated them in exquisite detail in hundreds of watercolour drawings. She lived most of her life in Cumbria and Northumberland, and worked on her collection mainly between 1846 and 1874. Among her most important specimens were many scarce orchids from Kent. From 1868 onwards she lived in Norham on Tweed in Northumberland, and when she died in 1918, at the great age of 98, she left both specimens and watercolours to the Natural History Society of Northumbria. The Society houses the collection in its herbarium and archives at the Hancock Museum, Newcastle upon Tyne. Dickinson is a good example of mid-Victorian endeavour in this area. She was pursuing her passion for plants at a time when botany was not yet recognised as a science, but was accepted as "a high-status activity for women, an obvious cousin to flower-arranging, flower-painting and gardening" (see Endersby). Yet the range of specimens that she collected on her extensive travels — which took her not only down to Kent but also up to Scotland and across to North Wales and Ireland — suggests a more passionate and informed dedication than that of the average lady hobbyist. As a single woman, she seems to have devoted most of her time to the pursuit. Her meticulous records and fine artwork also make it hard to see her as an amateur, either as a collector or as an illustrator. Notice that the specimens are also shown with their shadows. Left to right: (a) No. 210, Common Yew, collected from Wetheral, near Carlisle, Cumbria, in 1856. The Victorians no longer saw the yew only as a gloomy graveyard tree. (b) No. 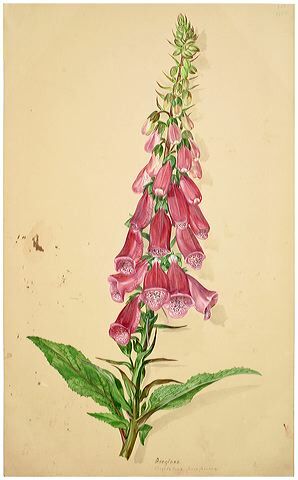 312, Foxglove, collected from Gattonside, near Melrose in the Scottish Borders, in 1861. It was said that the ".little folk" used to ring their bells, which was probably why Jane Eyre recalled looking for elves among them as a young child. (c) No. 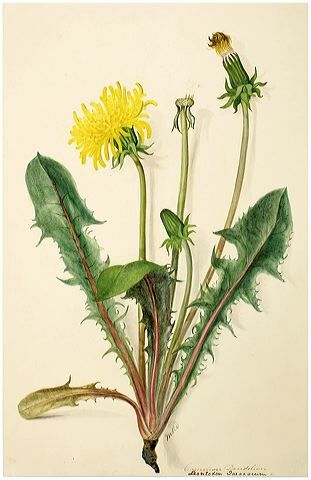 5, Common Dandelion (origin and date of specimen not given), the scourge of gardeners but admired by Richard Jefferies. Whatever status we accord Dickinson, she was one of the finest of those who encouraged close attention to our native flora, and opened up the subject for future scientific study. The wild flowers that feature in art works, design and literature, are often shown in loving detail in the Victorian period. The Pre-Raphaelite Brotherhood, especially, brought very precise depictions of them into their paintings. Even after his true Pre-Raphaelite phase had passed, John Everett Millais painted speedwell almost photographically in Little Speedwell's Darling Blue (1891-92), showing his little granddaughter looking reflectively at the plant in her hand. With its connotations of life as a journey (since it grows by the wayside), hope (embodied in its name) and fragility (suggested by its tiny blue flowers), speedwell is enormously evocative here. Such designs as William Morris's Honeysuckle pattern of 1876 became hugely popular. And in poetry, even the features of the graveyard yew could be better appreciated now: Coventry Patmore has a cheerful picture of a robin feeding on its "honey'd drops of crimson dew" in his Victories of Love. Examples abound in the novels, too. Jane Eyre, for example, recalls searching for elves among "foxglove leaves and bells" (Chapter 3). As for nature writing, such as Richard Jefferies', there are now wonderfully accurate descriptions of a whole variety of plants. In "The Pageant of Summer," for instance, Jefferies writes admiringly of "[g]olden dandelion discs — gold and orange — of a hue more beautiful, I think, than the higher and more visible buttercup." In another time, Margaret Dickinson's work might have been better known, and seen as a valuable contribution to the Zeitgeist. Her chance should have come during her own lifetime, when botany began to find its place in the study of natural history. But, ironically, as it became recognised as a science, botany became the preserve of men. The role of women botanists then became less rather than more significant. Thus the young Beatrix Potter, who did advanced work with lichens, found it hard to be taken seriously in the late 1880s and 1890s. The director of Kew at that time was unwilling even to look at her highly accurate botanical drawings (see Kutzer 36-37). So Dickinson remained largely unknown. It is all the more fortunate, then, that her painstaking, delicate and even moving artwork has been preserved, and can be properly appreciated in our own day. For more about her life and work, and an online gallery with over 460 more images of her illustrations, along with dates and locations of collection, see The Watercolour Drawings of British Wild Flowers by Margaret Rebecca Dickinson on the Natural History Society of Northumbria's own site, from which the biographical information here has been culled. Kutzer, M. Daphne. Beatrix Potter: Writing in Code. London: Routledge, 2003.